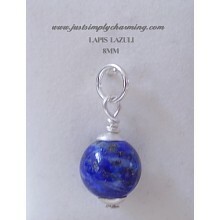 Stunning Lapis Lazuli semi-precious stones are a vivid blue colour comprised of several minerals, including Sodalite, Lazulite, Calcite and Pyrite. A highly valued gemstone for thousands of years, Lapis is thought to impart wisdom and knowledge, and to enhance intellect and insight. In history, artists would often use ground Lapis as a pigment in dyes and for painting. Stone originates from Afghanistan.